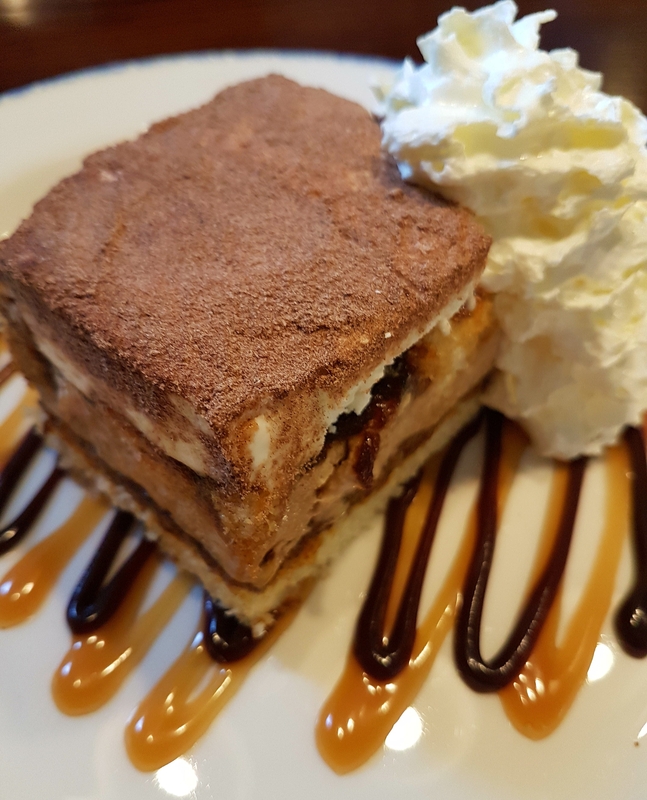 As a parent, I am always on the lookout for family-friendly places to eat, so was delighted to be invited to visit The Three Horseshoes in Sheldon, Birmingham to share my experience with you. The Three Horseshoes is part of the Sizzling Pub chain and has recently re-opened following a major refurbishment. I had never been there before so can’t comment on what it used to look like but I can say the interior now is modern, light and airy with very comfortable seating. It was clean and well presented, with two bar rooms… one for just drinking (which we didn’t go into) and one for dining. I was booked in for a meal with my partner Del and son Luke at 5pm, and we could see as we pulled up that it is a popular pub with people to have a quick drink on their way home from work. The main entrance door to the pub is on Coventry Road but the car park is at the back on Horse Shoes Lane, and the entrance from the car park takes you straight into the dining area. One word of warning about the car park though: it is a Pay and Display car park which we weren’t expecting as we have never seen that before at a pub or restaurant, so make sure you have change for the machine! You do get a refund for it though if you use the pub so it isn’t an issue. I’m only mentioning it so that you have change ready if you decide to visit. I’m going to be completely honest in my review as honesty is the basis of all my posts and I would never mislead anyone by saying positive things if they weren’t true. With that in mind, I have to say my first impression of the pub wasn’t great when I saw it from the outside. It has the external appearance of an “estate pub”, without meaning to sound bad, albeit a very nicely decorated one. BUT don’t let that put you off!!! The staff, the food, and the atmosphere more than make up for it’s external appearance, as you will soon read. It is a definite example of why you shouldn’t judge a book by it’s cover. This pub is a real gem! As we had been pre-booked for a meal, a table had been reserved for us. If you don’t book, you choose your own table and seat yourself. Our table was a booth type with extremely comfortable seating and plenty of room. All of the tables were well-equipped with a range of well-presented menus, cutlery and condiments. This is where I saw something I have never seen before at any pub or restaurant but it really impressed me… every bottle of sauce, vinegar etc had a label on saying what date it had been opened, what date it had to be used by according to correct storage after opening, batch number, and the use by date of the product on the bottle. I loved this detail! We have been to some places where the ketchup looks like it might have sat there for months, but all of the condiments at The Three Horseshoes were fresh and had only been opened a week (or less) before. This told me that this is a pub that cares about quality, and that small detail made me keen to try their food. The atmosphere here was lovely. There was music playing at a level that you could hear clearly, but wasn’t too loud so you could enjoy your time there. The staff were very friendly and welcoming, and made us feel comfortable and valued. We didn’t have starters as we wanted room for dessert and we can never manage 3 course meals. There were so many choices on the menu! As well as the main menu, there was also a separate kids menu and a Golden Years menu for older people with smaller appetites. And of course a drinks menu. The dishes all sounded so tempting and I couldn’t believe the prices. They are cheaper than many other pub restaurants, which at first made me think the ingredients wouldn’t be that great. How wrong was I?!? The food was among the best we have EVER eaten and cooked to absolute perfection. I tend to stick to one of a couple of meals in pubs that no one can really make a bad version of… lasagne or Hunters chicken. This time though I decided to try something different. As this is a Sizzling Pub I thought I should really try a sizzling skillet dish. 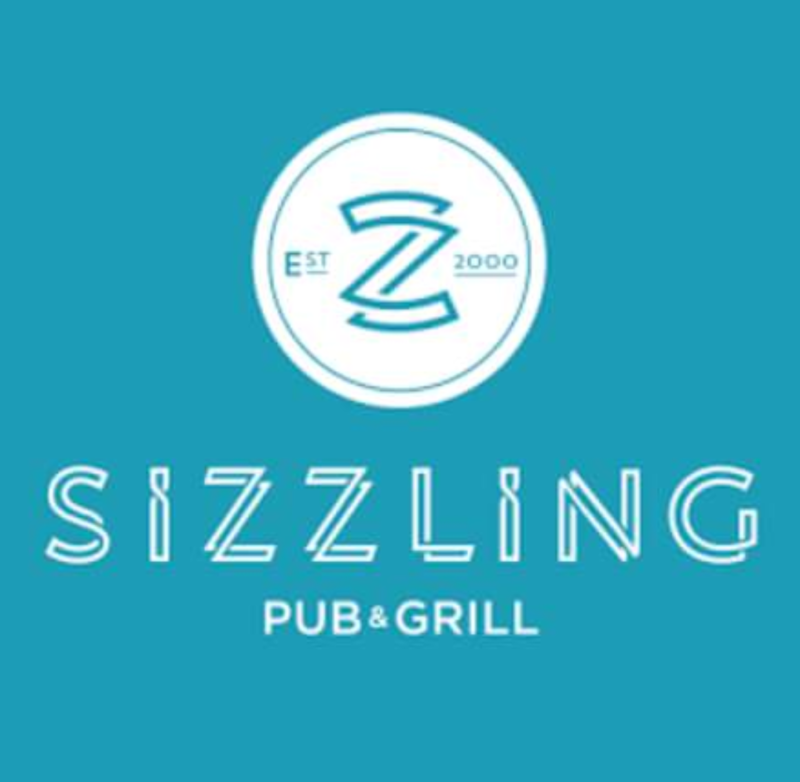 Sizzling Pubs say that if your skillet meal isn’t sizzling at your table, they’ll bring you another one. 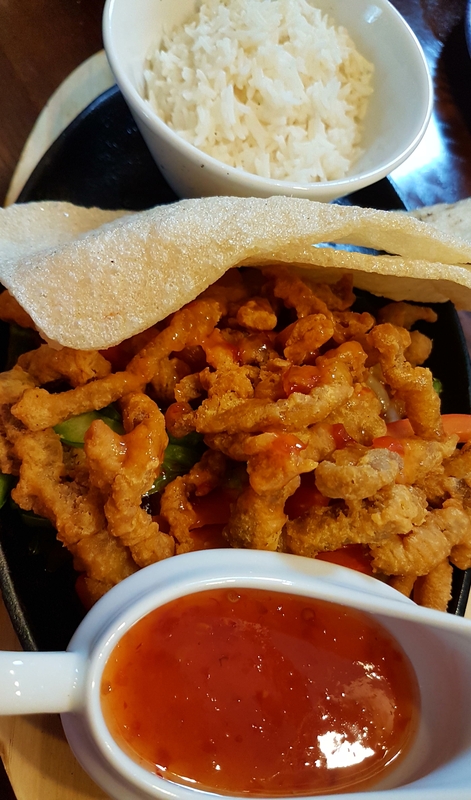 I decided to have one of the new dishes on their menu – Crispy Sweet Chilli Beef (crispy strips of beef on a bed of onions and peppers, served with rice and a giant prawn cracker and sweet chilli sauce). This was absolutely delicious! The sauce had just the right amount of a chilli kick, the beef was crispy and so flavoursome, the rice was fluffy, and the peppers and onions were soft and juicy. And it was still sizzling for ages after it arrived at the table! I definitely chose the right meal as this was amazingly good. 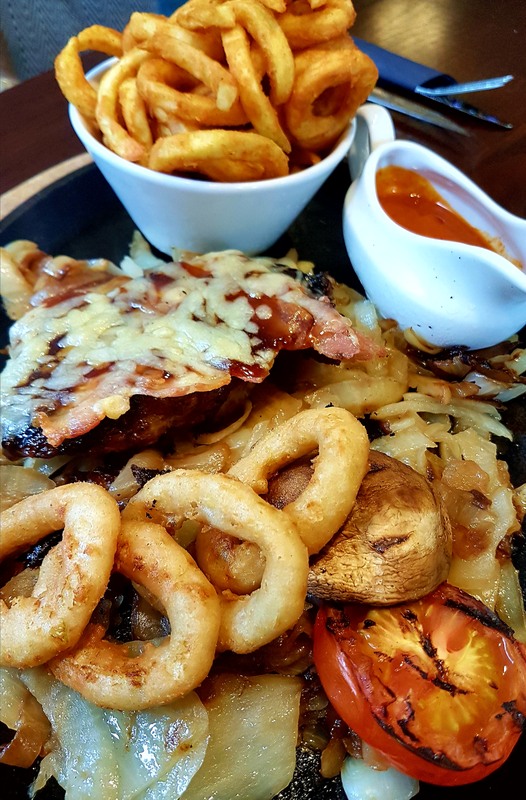 Del is a steak man, so decided to try one of their loaded steaks – The Tennessee (8oz sirloin topped with crispy streaky bacon, bourbon glaze and melted Cheddar, served on a bed of fried onions with a grilled flat mushroom, grilled tomato, onion rings and seasoned chips). He swapped the chips for curly fries and had a steak sauce to go with his meal. As you can see, the portions are huge! He had asked for his steak to be cooked medium to well done, and that’s exactly what he got. He let me try a bit of it and I was so impressed by the quality of the meat. He had been given a steak knife to cut it with but it was so tender that you could use the usual round ended dinner knife, and it melted in the mouth. I didn’t think he would manage to eat such a large meal but he enjoyed it so much he ate every last bit. He said the steak was better quality and cooked better than anywhere else we had eaten, including a rather posh steakhouse. Again, this meal was sizzling frantically on our table. Luke chose his meal from the kids menu. There are 2 kids menus – under 5s or over 5s. Both menus have the same ordering process. Choose the main part, a side dish, a vegetable option, and a dessert. 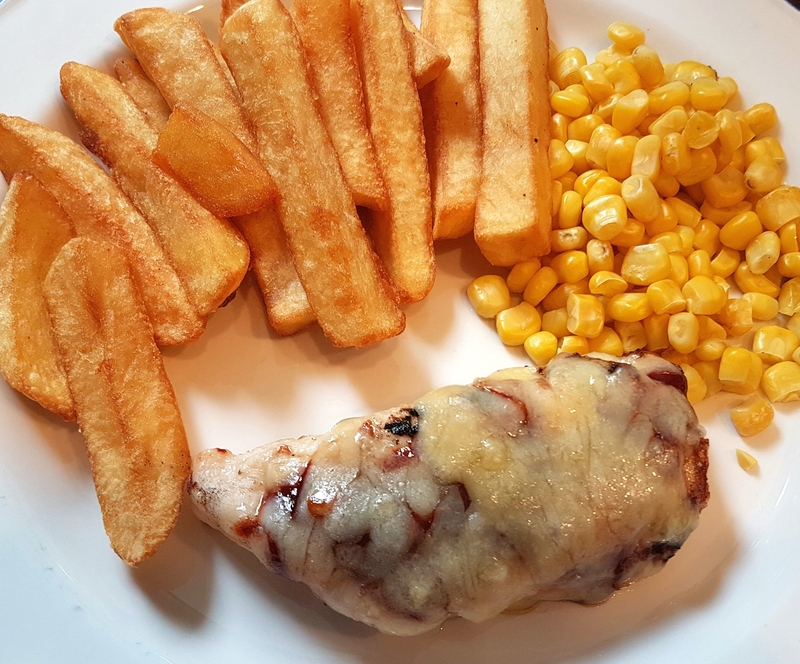 Luke chose the BBQ Chicken (Half a grilled chicken fillet with BBQ sauce and melted cheese), with chips and grilled corn cobettes. We were told they had no corn cobettes so were asked if sweetcorn would be ok, which he agreed to. The portion size was one of the largest we have seen for kids in any pub, which was great. Luke is 11 so adult meals are too big for him. Often kids meals leave him feeling hungry as portions can be a bit small though. This one filled him up nicely. The chicken was beautifully white inside and tender. The chips were golden and crispy and tasty. The empty plate at the end proved how much he enjoyed it. Although we all felt full we waited a while to let the food go down a bit, then decided on dessert. This was really hard to choose as all of the options sounded scrummilicious. We eventually reached our decisions but when we went to order Del and my choices (Nestle Rolo Cheesecake and Lemon Meringue Bar) were unavailable that day. That wasn’t a problem though as everything else was available and equally scrumptious sounding. I chose the Ice Cream Tiramisu which was served with Belgian chocolate and Devon cream toffee sauces, and fluffy cream. I’m actually glad they didn’t have the cheesecake as this was just gorgeous! And beautifully presented. I struggled to eat it all as I was so full but there was no way I could waste any of it either. It was THAT good! 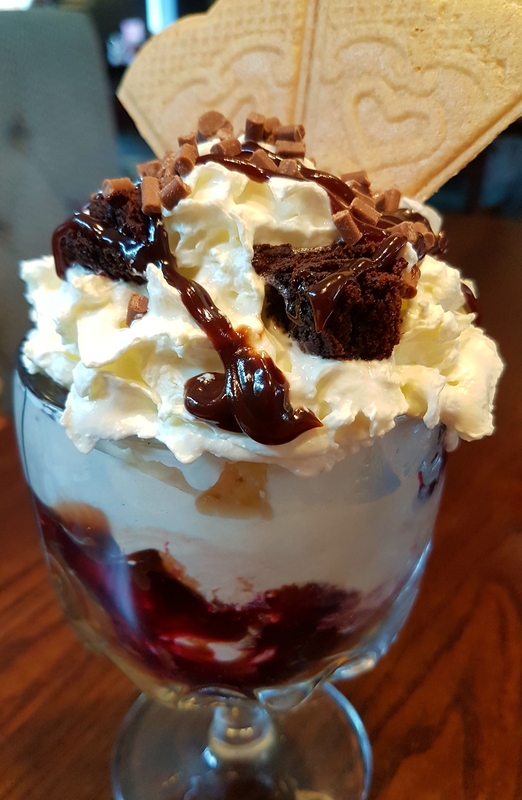 Del had a Black Forest Sundae, which included brownie pieces, ice cream. black cherry compote, Belgian chocolate sauce, fluffy cream, chocolate sprinkles and a wafer. It was huge! He managed most of it though, and said it was amazing! Full of Black Forest flavours. Luke chose the Build Your Own Sundae from the kids menu. 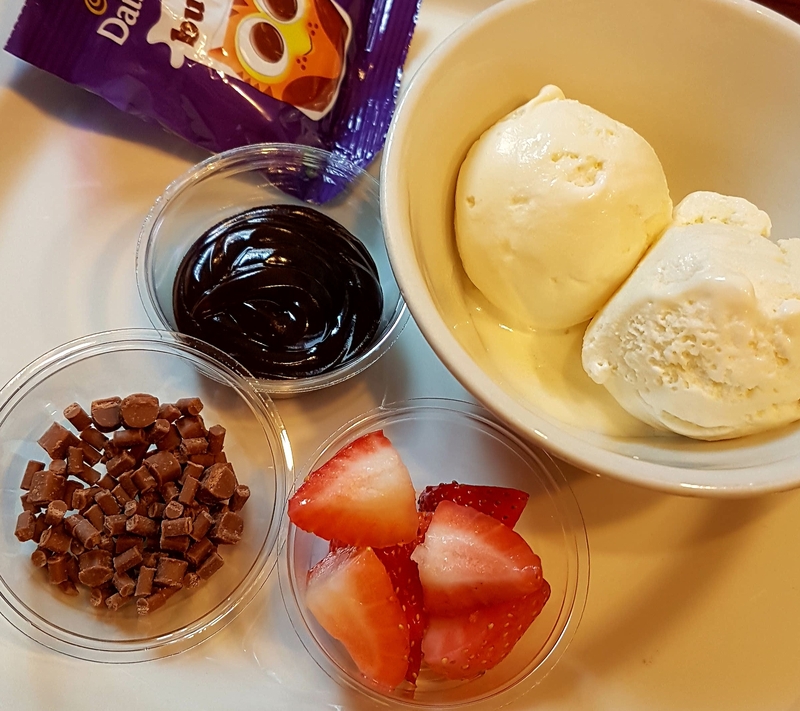 This contained 2 scoops of vanilla ice cream, Cadbury Dairy Milk Buttons, fresh strawberries, milk chocolate pieces and chocolate sauce. He loved this! He had fun making each spoonful different, changing the combinations of ingredients. This is such a great idea for children. It made his dessert last a lot longer than a normal kids dessert would have. We were so impressed with the food that we found out the name of the chef who cooked it. Rob is a chef who clearly cares about taste, quality, and presentation, and likes to make sure that people have a satisfying meal here. He is a real credit to the pub. Another credit to the pub is Billie, who was the duty manager in charge that day. She was very warm and friendly, knowledgeable about the dishes, and made sure we had everything we needed. She was attentive without being over the top, and made us all feel so welcome. You can tell that the staff here care about the pub and the customers and like to make sure everyone has the best possible experience. I would have no problems taking children of any age here as the atmosphere was warm and inviting. Something else I noticed too that was a lovely surprise: I didn’t hear a single swear word during the whole time we were there! That is rare nowadays sadly so it was such a refreshing change! I think the fact that the main drinking part of the pub is in a completely different area helps, and it makes the dining part very family-friendly. We did see a couple of people who were just having a drink with no food, but you could tell they just wanted to be in a quiet spot away from everyone. The only thing that could make it slightly better for kids is if they had activity sheets or packs for them to do at the table while they wait for their food. Maybe they do have them for younger children though, but I didn’t see any and Luke wasn’t offered anything like that. So, final verdict. Would we go here again? Definitely yes, even though it is 23 miles away from our house! Did we enjoy our experience? Massively! Is it a family friendly pub? Yes. Value for money? Fantastic! The Three Horseshoes is very close to Birmingham Airport so I would recommend having a meal here if you want to unwind after a long flight. Take a look at the menus HERE and you’re bound to find something to tempt your tastebuds! Thank you to everyone at The Three Horseshoes for a wonderful experience. We loved every moment! DISCLAIMER: We received our meal for free in exchange for an honest review. That in no way influenced our opinions and everything I have said is true. I only recommend products/services/places that I genuinely approve of and enjoy, as making false or misleading statements helps no one and destroys trust. Thank you for reading.